Centuries have passed since life ended on the blue planet. Humanity’s survivors are now dispersed among distant colonies, thousands of light years from the barren, frozen rock that was once their home. At a time when power means everything, the ultimate power, the imperium, rests with the Consulate Magistratus. In return for its protection, citizens must concede their rights absolutely. The Magistratus controls interstellar travel, access to technology, even procreation. Every citizen is implanted with a device to monitor their location, health and emotions. Freedom, religion and self-determination are anachronisms. Humanity’s true history survives only in whispers of a secret archive. In the cold of a winter’s night, a small village is the subject of a brutal attack. A fourteen-year-old boy, Jordi, sees armed men approaching and manages to wake his family. He and a handful of survivors flee into the frozen, snow-covered forest to wait for the preacher who told them their way of life was based on lies. Shepherd, a freighter-tramp and smuggler, is commissioned to deliver illicit medical supplies to a hostile border planet near the Wall. He is dragged into a fight he does not believe in and a desperate struggle to protect his ship, his way of life and the lives of the persecuted few who seek only freedom. The Heretic is the bestselling first book in a longer tale spanning four volumes. The award-winning Beyond the Wall series is gripping, epic space opera, written as hard science-fiction. It is the story of humanity’s future and the discovery of the truth of its past. 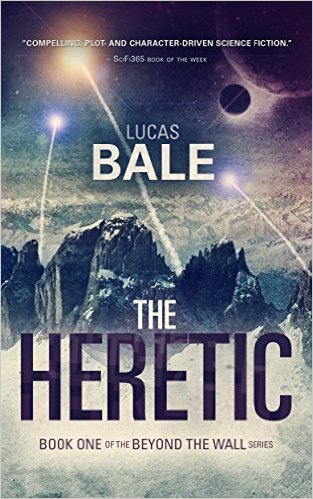 If you’re a fan of Firefly and have been itching to get your hands on something similar, you’d do well to read The Heretic by Lucas Bale. The story starts with a raid on a small village of exiles on a planet close to The Wall, the boundary between the civilised galaxy and the rest of the universe. It’s not clear why the village was attacked but there are hints it has something to do with them following the teachings of a heretic preacher. When Shepherd, a sometimes smuggler arrives at the planet withe supplies for the village just attacked, he finds himself caught up in something much bigger than it first appears. This story is tight, well-written, with a group of characters that are relatable without falling into standard tropes or clichés. What works especially well is the feel to the book. It’s a great combination of hard science fiction and the lawlessness of a western, and it’s no surprise that Bale acknowledges Firefly as a major influence. The story is short for a novel but this length suits the story perfectly, allowing it to barrel along at a good pace. I highly recommend this book.